The Condor Elite Fail Safe pack is a phenomenal, low profile, every day carry bag. I have put this thing through hiking, travel, and week long field excursions. It has held up in it’s entirety and served me for over 18 months with no issues. This Condor Elite series is sure giving me what I want, through every mission. Front vertical zipper pouch for ease of access. Color match small hook and loop ID panel. Vented & cushioned backing for comfort. Three color choices for every mission. Black, Graphite, or Coyote. Hydration pouch & ambidextrous hose holes. Chest strap with stow away option. Easy to detach waist strap. Hidden, attached, but removable waterproofing cover. YKK zippers throughout with paracord pull cords. Rhino skin on handle as well bottom of pack to increase durability. Main compartment high strength nylon divider. Constructed with 500 denier Invista Cordura Nylon. This bag, for me, is a necessity. With it’s 16 liter capacity, I can keep my everyday stuff securely in the bag while adding more to it with no issues of it becoming cumbersome or heavy. (Depending on what you are packing) At the time, the selling point for me, was the internal to external waterproofing cover. With the amount of time I spend outdoors, on my motorcycle, or just going to and from work, I love having the option of making sure my bag is sealed off from the elements. With the seven external pockets strategically placed for ease of access, and the massive admin pouch, I was sold. The added Rhino Skin on the handle and bottom makes sure I can put this bag through the ringer and still have it come out swinging for the next thing I put it up against. The quick detach shoulder straps means that when I do off body carry, I can get to my firearm quickly and proficiently. The vented back keeps me cool and the padding makes sure I have a comfortable fit every time. I keep my waist strap off and secured in an internal mesh pocket for hikes, but the bag without it still sits incredibly comfortable. On the bike, even at cruising highway speeds, I feel no wind resistance. This pack is a great everyday carry bag that can be quickly modified to fit whatever your mission dictates. From the YKK zippers and Rhino Skin, to the hidden dry cover and great storage, this bag will fit whatever your day throws at you. For all you “Gray men” out there, the Fail Safe makes sure you blend into your surroundings without screaming “Hey, I’m tactical and have a gun”, while still giving you exactly that. 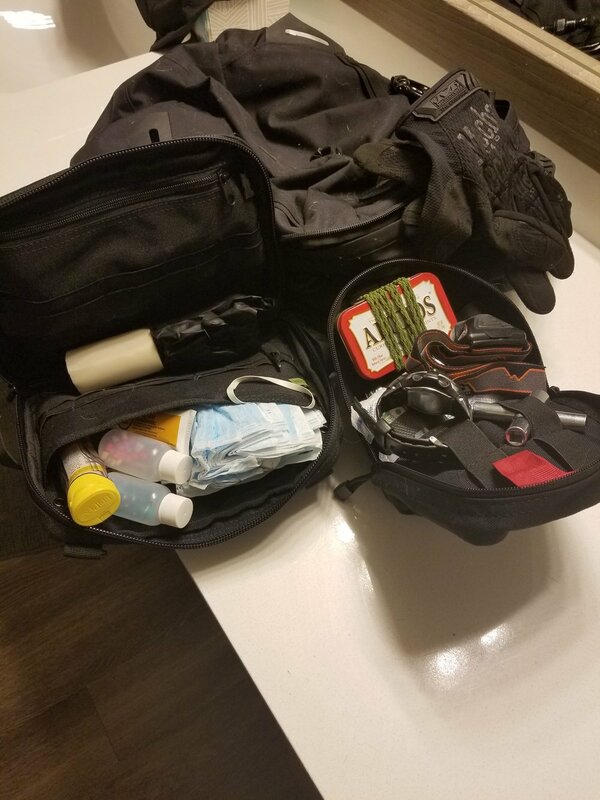 On the average day, I have a med pack, urban survival pouch, laptop, note taking gear, firearm, spare mags, water bottle and whatever else I will need that day, without the bag ever looking bulky or running out of space. If an all around workhorse that blends in is what you are looking for, then head on over to Condor’s website and pick one up. I’ll spend a week traveling this month and plan on, once again, taking this bag and my dog only, while removing TSA banned materials and still being able to live out of this pack alone. I give this pack a solid 4.5/5 while deducting half a point for the lack of elastic mesh water bottle holders.